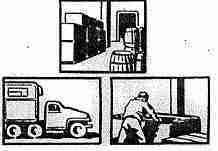 www.packagingrevolution.net is pleased to present another key article from the formative years of palletization. After the war, between one and three million surplus pallets may be disposed of by the government. Commercial shipments of palletized unit loads are expected to become common. Some pooling method for collecting pallets and re-distributing them to industry is likely to be developed. The logical organization to provide this service is the public warehouse. It has the necessary transportation, packing and storage facilities. Now is the time for public warehousemen to prepare to secure this profitable business. In February 1941, the writer addressed the 50th annual meeting of the American Warehouseman’s Assn., and discussed materials handling, particularly the matter of pallets. It was suggested that warehousemen get together and develop a standard pallet size most suitable for the commercial warehouse field, and that they prepare for the handling and storage of palletized unit loads. Apparently, nothing was done to follow up this suggestion. When the impact of war struck in December 1941, the armed services became the greatest warehouse operation in the world. The first group to take the initial step in warehouse handling and storage methods, was the Office of The Quartermaster General, Field Operations Branch of the Storage Division. The preliminary work of establishing methods, for the most part, was under the direction of men who were not familiar with the details of materials handling methods, and they had to depend upon the advice of equipment manufacturers, which, in many cases, was not always of an unbiased nature. They were faced also with the responsibility of getting methods and equipment into operation so as to sustain quick results. One manufacturer was able to make quantity deliveries of a fork truck with a load capacity of 2000 lb. Consequently, the system was predicated on this particular truck, with the result that the pallet of the Quartermaster Corps was made to fit that truck load capacity. Hence, we have a standard Quartermaster pallet which is 32 in. long and 40 in. wide. A million or more of these were procured within a year, and placed in service throughout the country, and additional millions have been procured since then. Since the Quartermaster at that time operated all of the General Depots, the 32 x 40 in. 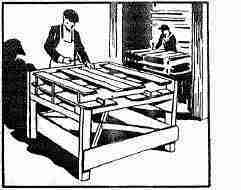 pallet was used by the Engineers, Ordnance, Signal Corps, and other service branches, and the Quartermaster also procured for those branches pallets of 36 x 50 in., 42 x48 in., 48 x 48 in., 42 x 72 in., and 42 x 56 in. These larger pallets were for use with fork trucks with capacities from 4000 lb. to 10,000 lb. As the manufacturers of fork trucks increased their production, the Quartermaster General procured the larger trucks for all services, and the use of larger pallets than the Quartermaster’s standard 32 x 40 in. became more common. The Navy, through the Bureau of Supplies and Accounts, started its materials handling program in 1942. By the time it was ready to procure fork trucks, the manufacturers were in quantity production, so the Navy bought very few 2000 lb. fork trucks and obtained more of the larger type, even 15,000 lb. units. For this reason, it standardized on the 48 x 48 in. pallet for inter-depot and overseas shipment, and the intra-depot movements on the 42 x 66 in. pallet. Here again, they procured, not thousands, but millions of these pallets which are distributed throughout all the states of the union, and to many of the advance bases, to Australia, India, Iceland and Europe. We hope we’ll soon be shipping palletized unit loads into Japan itself. However, because of this large use of pallets by the various branches of the armed services, there will come a time when they will not be required for the storing of supplies, and they will be classed as “surplus materials for disposal” with the result that possibly somewhere between one million and three million pallets will be disposed of by the government. The largest volume will be in the 32 x 40 in., 48 x 48 in. and the 42 x 66 in. sizes. It is logical to assume that the 42 x 66 in. sizes will be picked up by stevedoring companies for use in marine terminals, etc. These will be for storage purposes, but the other pallet sizes, no doubt, will be used for palletized unit load shipments by many manufacturers who are no learning the value of this method of shipment. Before the armed services procured so many pallets, industry had been thinking along the line of building pallets of light cheap construction to be called “single shippers,” that is, they would carry one load and then be discarded as scrap lumber. Of course, it is better to have a good pallet, and use it over and over again, not only for inter-plant shipment, but also for handling several operations within the plant. If the government surplus in pallets amounted only to a few hundred thousand they would be quickly bought up by industrial plants for use within their own plant areas, but since the quantity that will be surplus material, is large, and the price should be low, it is logical to assume that the cheap “single shipper” type of pallet will not be developed. Instead, industry is likely to absorb the surplus pallets. Return to History of Pallets home page.